This unprepossessing piece of ground was actually once a place of some significance. 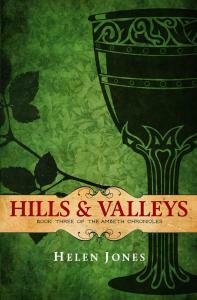 As we took the narrow path through tall weeds the land seemed to rise around us, cradling us in a bowl. 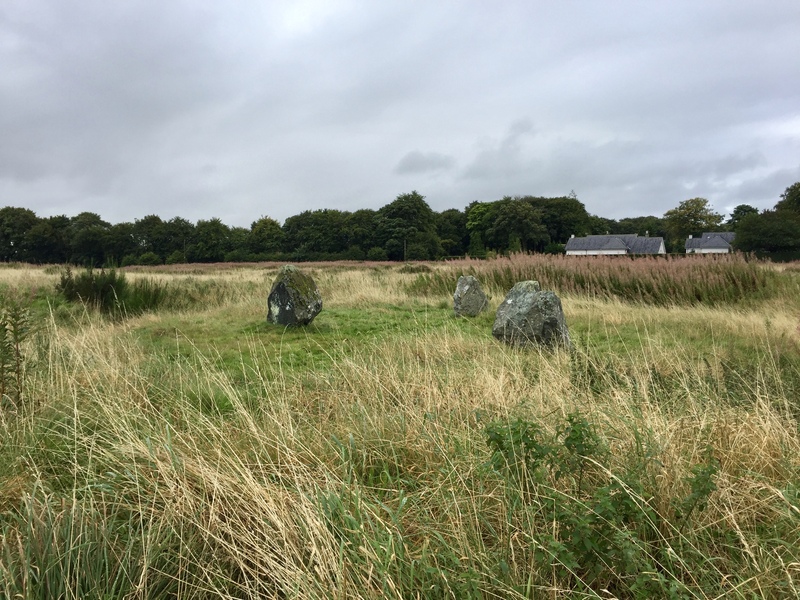 The long grass hid shapes that revealed themselves as we came closer, a circular henge surrounding three standing stones our destination. 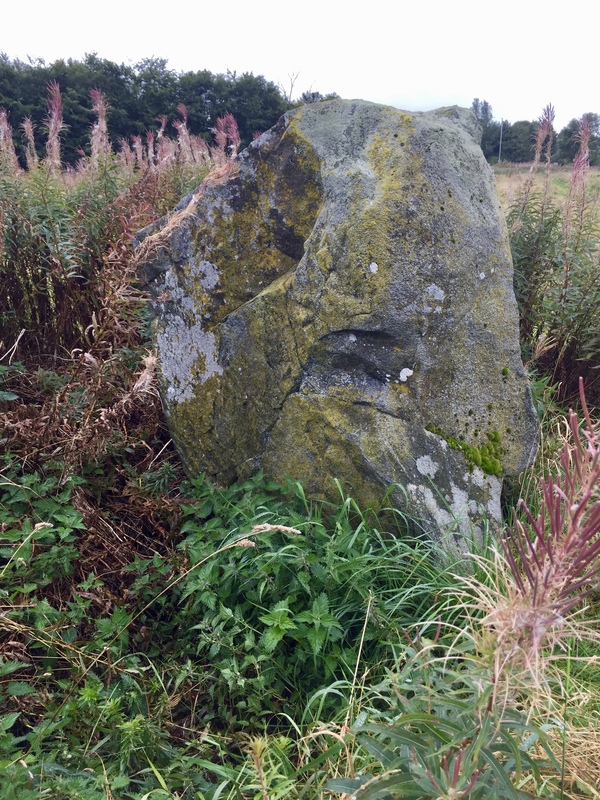 Another carved Pictish stone, the Broomend of Crichie, awaited us and, as we entered the henge, once again soft drizzle began to fall. The modern world seemed to fall away and, as the ancient site was described by our guide, it seemed to come to life around us. 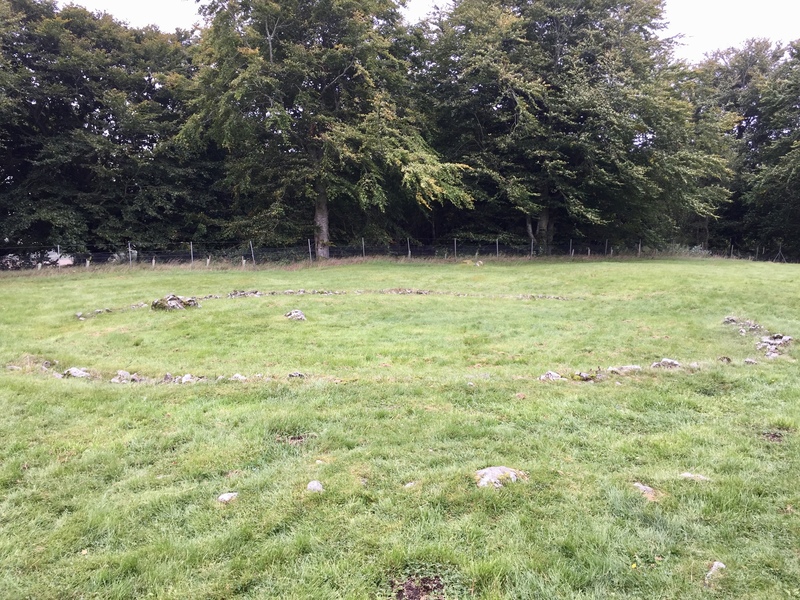 The long avenue once featured 12 pairs of stones – though only one stone remained, it was in situ, unlike the three stones in the circle. There have been excavations done on the site, but more work is yet to be done to fully understand this place. But we had to keep moving. It was the final day of the weekend, the companions all had places to get to before the end of the day, and there were still two more sites to visit. 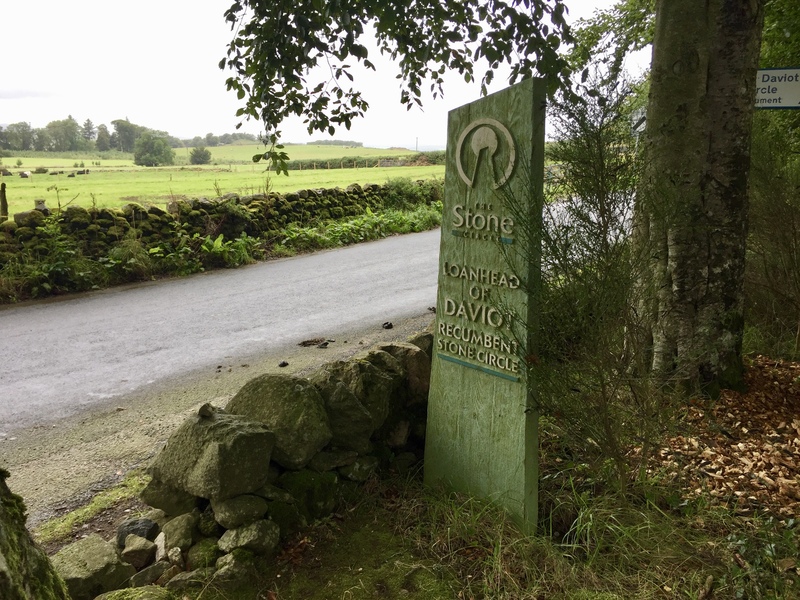 So we headed into the countryside once more, our next destination the Loanhead of Daviot, another recumbent stone circle. 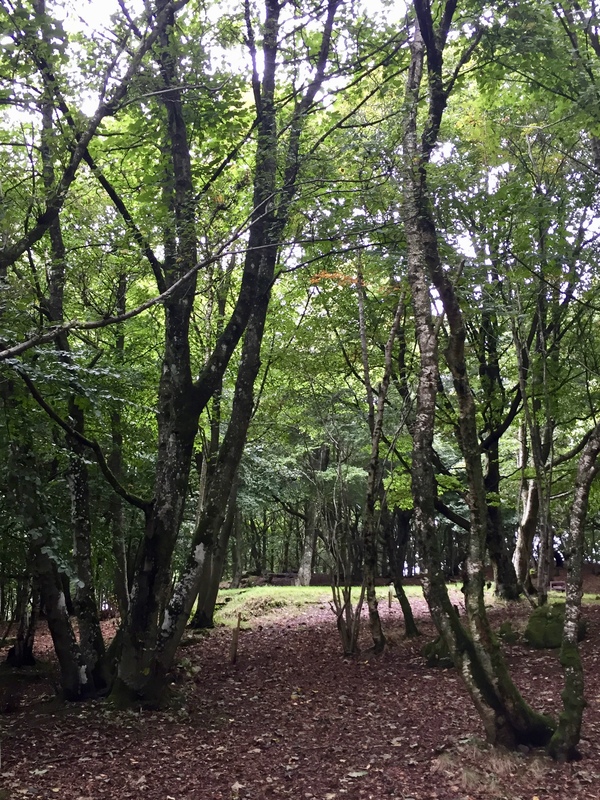 As we walked the pathway to the stone circle my gaze was drawn to the left, to a rise in the woods where I could see a couple of large stones, and I stopped to take a photograph. A tree up ahead seemed to hold the shape of a dragon, and the land itself felt full of wonder. The trees opened out and we found ourselves on the side of a slope, almost at the summit but not quite, as we had seen with the other recumbent circles we’d visited. 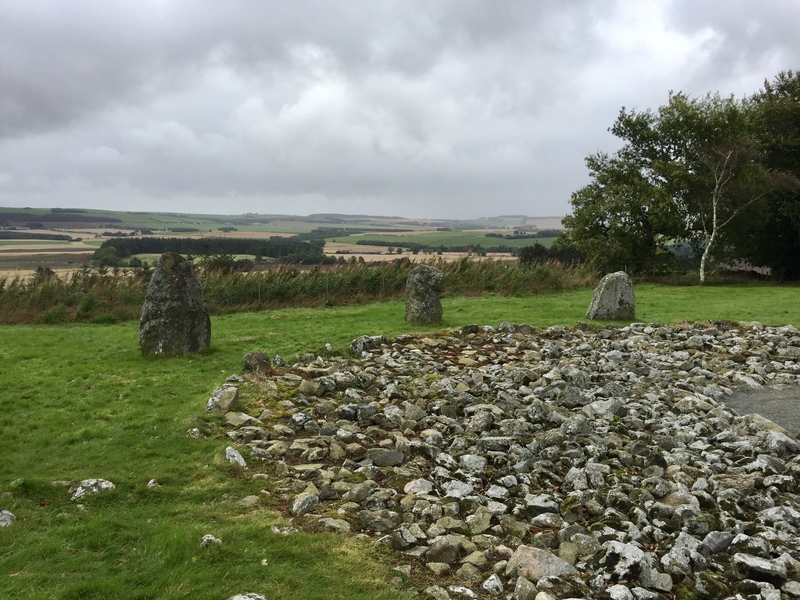 This circle was complete, and quite large – over twenty metres in diameter, the huge recumbent stone flanked by two taller stones. 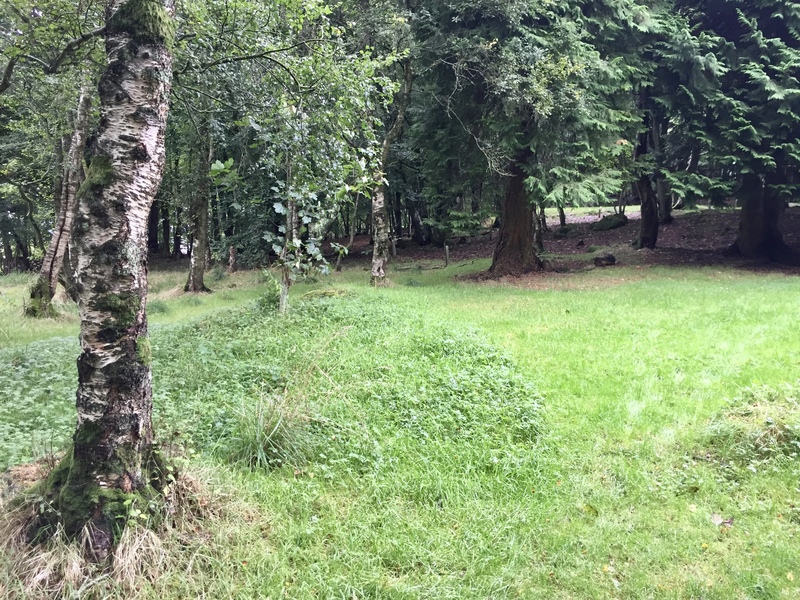 The remains of a circular burial cairn lay next to the circle. Excavation in 1934 found burials with Iron Age & Beaker pottery, while subsequent work uncovered flint scrapers and a Bronze Age sword mould, showing the site was in use for many centuries. 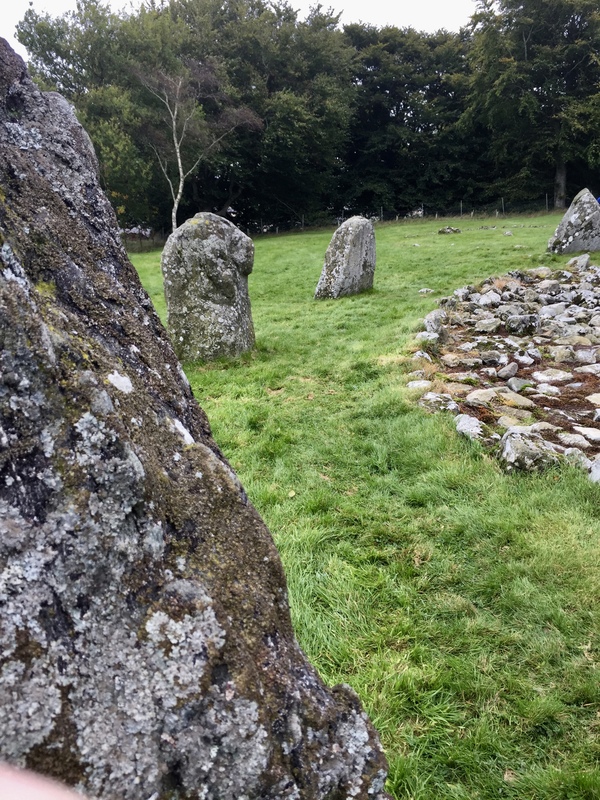 I was having this conversation with one of the companions, both of us bemused by the large jumble of stones spread across the centre of what was otherwise a perfectly lovely stone circle. There was none of the turmoil of Cullerlie here, but the stones were rough and difficult to walk on, not exactly conducive to ritual. It didn’t feel uncomfortable, it just felt… out of place. 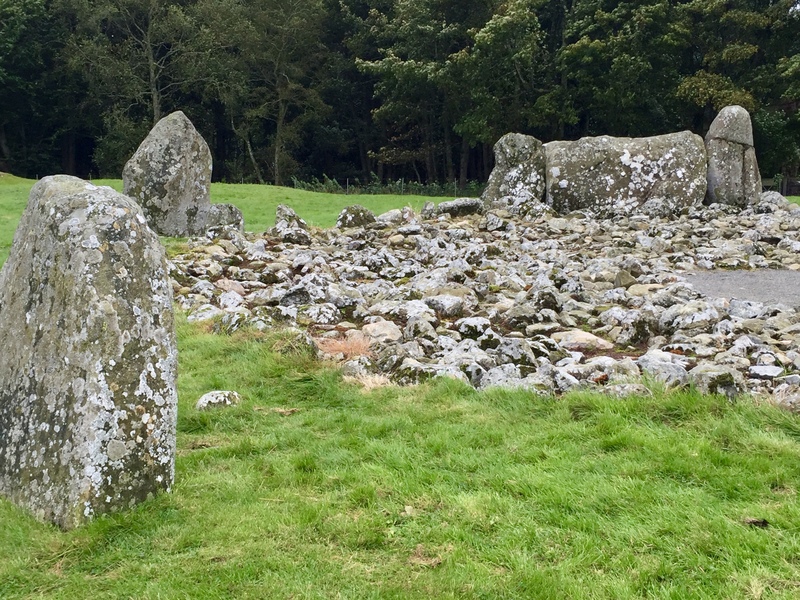 As we spoke, we heard our guide explain that the Victorians had moved the stones from the nearby cairn to spread across the centre of the circle, because they thought that was how it should be. Why they haven’t been moved back I don’t know. I guess it will remain a mystery. We stayed at the circle for a while, the usual rain appearing to soak us. By now it was expected, and we simply put up our hoods and got on with it. Our guide pointed across the small valley to the slope opposite, asking us what we could see. And there it was, another recumbent with two flanking stones, all that remained of another circle, the rest of it lost to time. 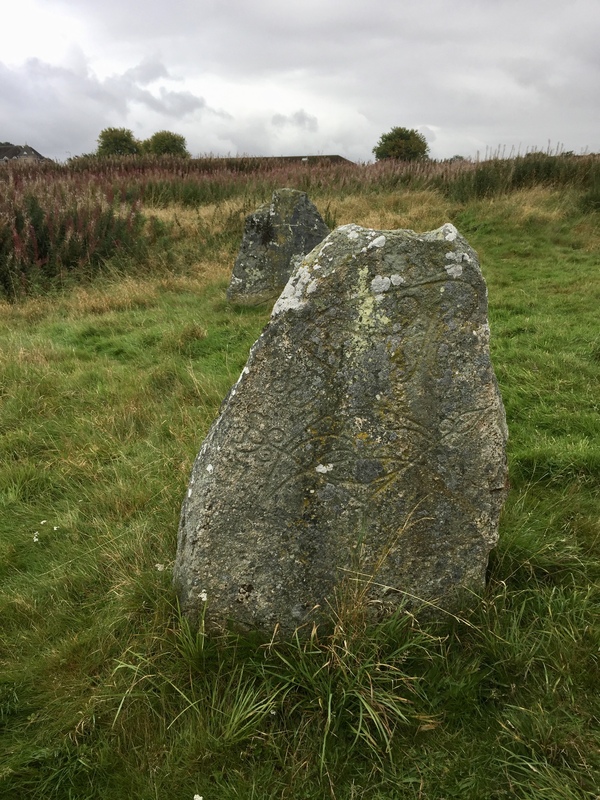 Clearly, to the people who worked this landscape, the circles were deeply significant and important enough to make in multiples – it’s a shame that we don’t really know why. 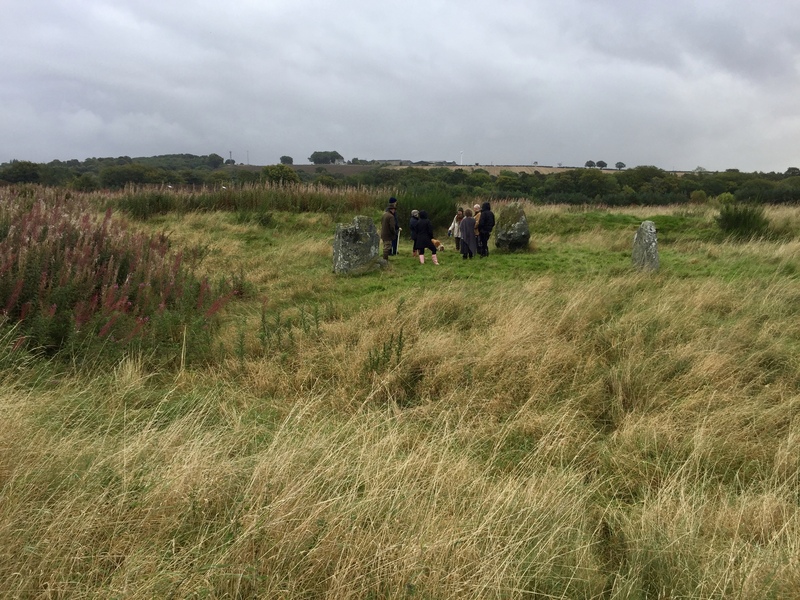 One of the group had stopped on their way in to talk to an older man working on the site, and he had told him a story of a ghost, a woman in a green dress, said to dance in the circle at night. 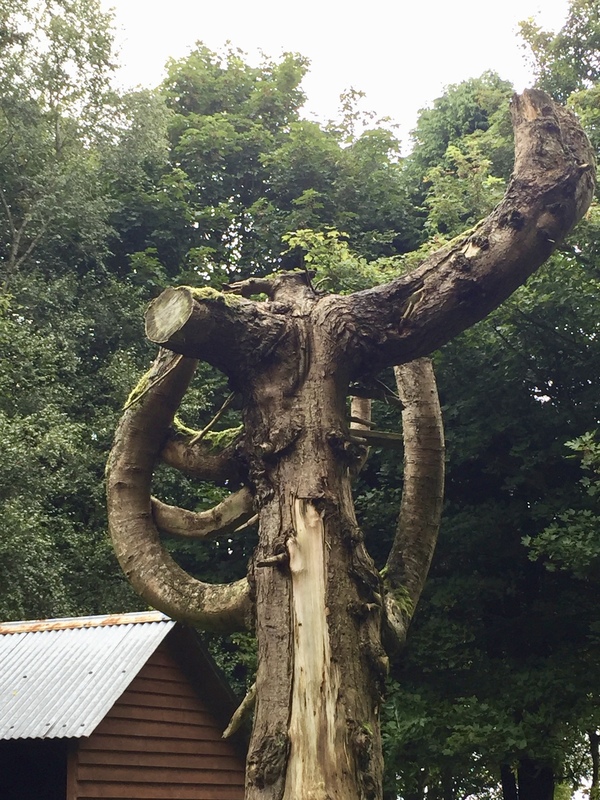 The area was used by Scouts and the story was told to scare them – we found it intriguing, in light of what we’d learned about the circles and their uses. I heard this very clearly, afterwards, the words strong in my mind, beautiful with their sense of freedom, their message reaching beyond the circle, a smile in the voice saying them. Whether it was the influence of the charming storyteller, or something else, I’m not sure. But it felt as though someone linked their arm with mine, wanting me to come with them. 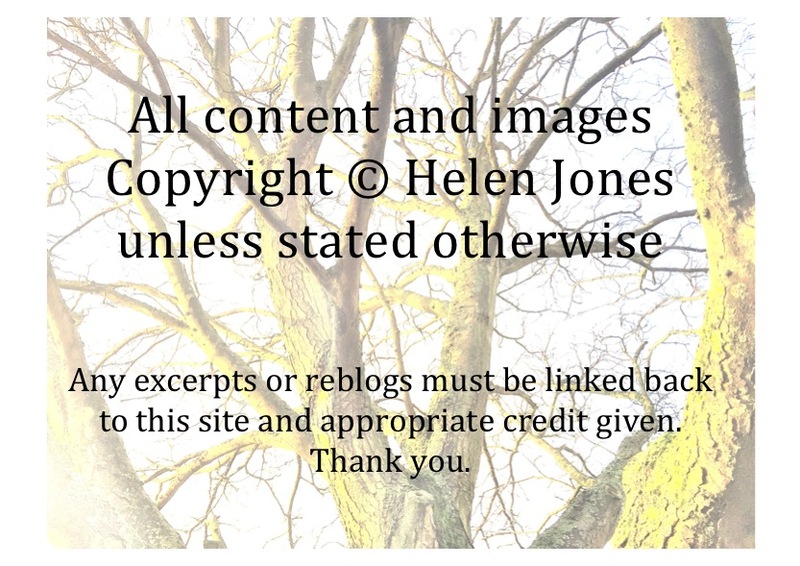 I went to the trees, a wire fence stopping me from entering the woods proper. But I think I could see what they were trying to show me. A small ridge, stones piled there, the same spot that had caught my attention as we’d entered the site. I took another photograph, because it felt like the right thing to do. This is my account of a recent weekend away with The Silent Eye. Click here to read Part 1, Part 2, Part 3, Part 4, Part 5 and Part 6. Oh boy. Really? I don’t think I knew that. But something, someone, whatever it was, seemed very keen to show me, in a nice way, like, here is my house, do you like it? 🙂 I really liked that circle too, it felt very clear, despite, as you say, the stones. I wish they could be removed. Love the story of the woman dancing being told to scouts. Lol. Hey, and a dragon in the midst. I hear druids chanting, see women dancing, and spells brewing. 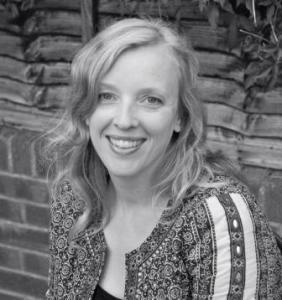 Will you be using any of your retreat experience in a story, Helen? 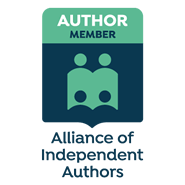 Don’t forget to pop over with an article about Ambeth four. Do I get a review copy? Look forward to receiving it, Helen. Isn’t it amazing how all these ancient places hide in the landscape in plain view, and how totally unaware most of us are? I think these weekends are really helping you to discover and develop and trust your intuition, something our modern society doesn’t believe in and has suppressed.